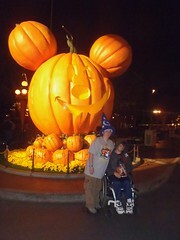 We cannot remember ever doing Disneyland during Halloweentime, although we must have, as we came for my 18th birthday back in 2005 and Mik's first Disneyland trip was my 10th birthday back in 1997. I know the Haunted Mansion Holiday at least was a thing in 2005, but somehow we do not remember there being Halloween decor or anything and really only rode Haunted Mansion Holiday once before when we visited during Thanksgiving weekend once. This year we decided to go to Disneyland for my birthday, since we seem to most times it falls on the weekend. Plus, we wanted to get more use out of our Premier Passes. It also worked out great as a chance to experience the Mickey's Halloween Party for our first time with the first date of it being last night. Also, nice to get the tickets for that when we had Annual Passes, as we saved even on the ticket for Mom. We went into Disneyland about 4 hours before the party. Yeah, your supposed to only get in 3 hours before, but our tickets said the party started at 6pm (bought and printed when only for sale for Annual Passholders) and somewhere along the line it changed to a 7pm start time. We had absolutely, no problem getting in right after 3pm, as we had planned for months to do. Would have been nice if the party was at 6pm as we originally thought, though, as Mik did not appreciate having to waste 4 hours in Disneyland and me not wanting to wait 30 minutes to have to transfer him on Star Tours. 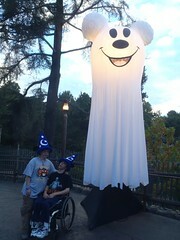 We did at least luck out and basically walk on to Haunted Mansion Holiday through and ride Buzz twice. The main thing we did during the actual party was wait around for the parade to start at 8:30pm. 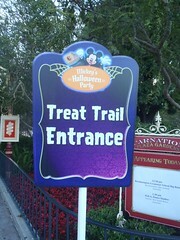 It was kind of cool, but Mik got tired by the end of it and we only ended up hitting one more trick or treat trail. We hit a good one, though, as we went to the one the goes through the beginning of the Pirates of the Caribbean regular queue and Mik thought it was fun to go under the archway for once, since he has only ever been through the exit. He kind of got into the trick or treating after that, but then heard the fireworks were about to start, so we hightailed it out of the park and to check for Grumpy clothing at World of Disney. I liked Main Street lit up after dark with the green lit windows and the projections of spiderwebs on City Hall and the Train Depot. 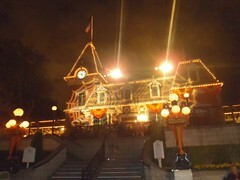 The Mickey ghosts and pumpkins are the park were also cool lit up and of course the Mickey Pumpkin on Main Street. Overall a fun evening, although, next time I would hit the trick or treating spots and skip the parade, so we could actually do more before leaving the park before fireworks. I should have known we would not last past the fireworks, since we usually purposely leave the park before them. Now to celebrate my birthday in Disneyland with Mik today.